Have a Halloween Hot Tub Party For a Good Time! Have a Halloween Hot Tub Party! Are you looking forward to Halloween this year? We here at Viscount Pools and Spa’s love Halloween, why you might ask? Because we think of Halloween as the official start to hot tub season! What better way to get into the spirit than by having a Halloween themed hot tub party! 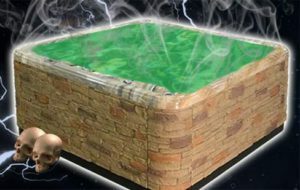 Preparing your Hot Tub for the Spooks! What a great excuse to get your hot tub cleaned and ready! Also, if it has been a few months since you have had fresh water in your hot tub, drain the water out and clean the surface of the hot tubs shell, lights, and jets. Fill your hot tub back up with fresh water, add sanitizers and water chemicals, clean filters and even add a SmartBar to your hot tub for easy drink making connected right to your hot tub! With a drawer and slip resistant treads, you won’t even need to get out! Don’t forget to make your hot tub look spooky, even dangerous! Your guests will eat it up, or scream, or be dying to get in! If you have one of our Emerald Spas with LED lighting, set your lights to red or green you can even add your own LED hot tub lighting for a more intense scare! Add a sign to enhance the anticipation of getting into the hot tub! It could be a huge pot of witches brew just for you and your guests. You could add plastic body parts or skeleton bones floating in the water and around your hot tub. Don’t forget the Halloween Treats! 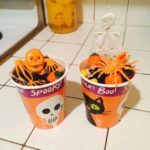 Here are our skeleton hot tub pudding cups for the party! Mix together milk and pudding packet over a stove top (if you want the pudding to be a little more “Adult” add a shot of liquor at this step). Put the mix into your cups and into the fridge. Here is where it gets fun! Decorate your pudding cup with crushed Oreo, candy corn, and various accessories to make it festive! These treats are great for the party but not so much for the hot tub, advise your guests to not eat in the hot tub. You don’t want food floating in the hot tub or getting clogged in the filter. Remind your guests to stay hydrated through the night if they are drinking alcoholic or sugary drinks, hot water can cause dehydration, time in the hot tub will need to be limited. No problems getting in and out to get your bones back together! After hot tub party Clean up! When your Halloween hot tub party is over it will be a good idea to rinse and repeat! Do the same thing we suggest pre-party, but it may be even a little deadlier! Drain the water and clean the shell, lights, and filter, make sure all traces of makeup, fake blood and any other body parts are gone so you can get your hot tub back up and running to enjoy the rest of the season! Don’t forget to remind your guests to bring their suit and towels, provide extra if necessary. In addition, Viscount West is happy to help you with any hot tub questions spooky party or not! Finally, come see us your local hot tub retailer at many locations to serve you in Michigan.